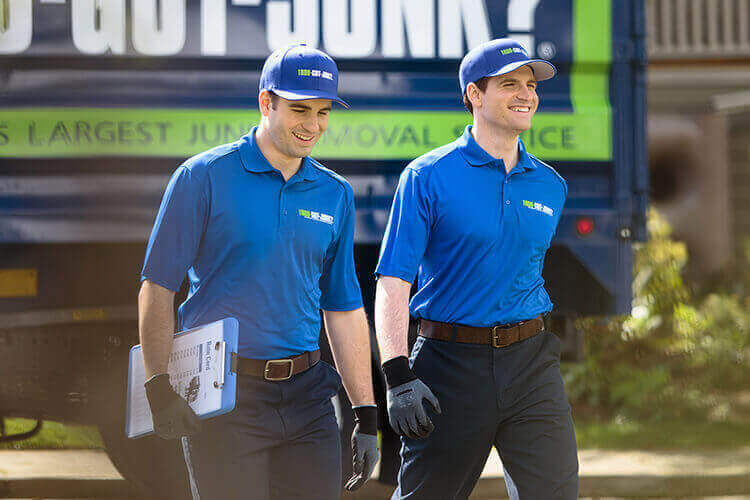 Hot Tub Removal & Disposal | 1800-GOT-JUNK? If you have an old hot tub to get rid of, it’s not the something you can easily handle on your own. Even if you can find some friends who are willing to help you out, it’s still quite a tricky task. Save yourself some time and a whole lot of effort. Let 1800-GOT-JUNK? take care of it for you! 1. Simply schedule your hot tub pick up online or by calling 1800-468-586. When you’re ready to get rid of that old hot tub, book a free estimate with 1800-GOT-JUNK? by using our simple online booking form or by calling us at 1800-468-5865. We have same-day service, so give us a call anytime, and we’ll be right over. To get your hot tub ready for removal, there are a few things you’ll need to do before we get there. First, you’ll need to disconnect the power supply. Then you’ll need to drain out all the water and allow the tub to completely dry. Lastly, you’ll need to ensure there’s a clear path to the hot tub for easy removal. That means clearing away any yard waste or debris that might get in the way as we’re moving it out. If you don’t want to handle your jacuzzi removal on your own, you can always call 1800-GOT-JUNK?. We’ll do all the heavy lifting for you—we’ll remove the jacuzzi right from where it’s located (and disassemble as needed) and load it into our trucks. We’ll then make sure it’s recycled or properly disposed of, so you don’t have to worry about it taking up space in the landfill. If you don’t want to handle this on your own, you can always call 1800-GOT-JUNK?. We’ll haul away your hot tub cover for you, and ensure that it gets recycled or properly disposed of.